And even for a seasoned spaceflyer, the sight was amazing to behold. It was "the most amazing thing I've ever seen in space," Burbank said in a NASA video. "And that's saying an awful lot because every day is filled with amazing things." Burbank took about 100 photographs of comet Lovejoy as it rose above Earth at night on Wednesday (Dec. 21). At the time, the space station was sailing 240 miles (386 kilometers) above Tasmania, Burbank said. Then the long, bright tail of the comet began rising up from the Earth's horizon. Burbank is in the middle of a six-month mission to the International Space Station. He leads a three-man crew (two Russian cosmonauts round out the team) and is preparing to welcome three more astronauts on Friday (Dec. 23). A Russian Soyuz spacecraft carrying the new crewmembers launched on Wednesday. Comet Lovejoy was discovered on Nov. 27 by Australian amateur astronomer Terry Lovejoy. The comet was estimated to be about 660 feet (200 meters) wide, larger than two football fields, when it was first seen. The comet was quickly identified as a so-called Kreutz comet, a comet on a path that flies extremely close to the sun. Then, on Dec. 15, comet Lovejoy plunged into the sun's outer atmosphere. The comet zoomed within 87,000 miles (140,000 kilometers) of the sun's surface, and many astronomers predicted it would not survive such a close solar encounter. But comet Lovejoy defied the odds and re-emerged on the other side of the sun. The event stunned astronomers and was captured by several sun-watching observatories in space. 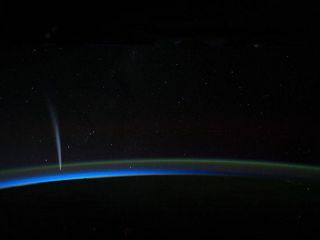 Comet Lovejoy is visible near Earth’s horizon in this nighttime image photographed by NASA astronaut Dan Burbank, Expedition 30 commander, onboard the International Space Station on Dec. 21, 2011. The swing near the sun did rip comet Lovejoy's tail clean off, but over the last week the comet has grown a new tail of gas blown back by the solar wind. "When it disappeared behind the sun, I think astronomers thought it would not appear again, it would probably burn up," Burbank said. "But it's probably the most spectacular thing that you can imagine."